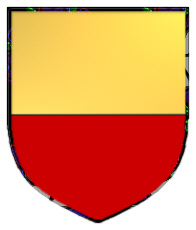 Coat of Arms: A shield divided per fess gold and red. Spelling variations include: Hall, Halland, Hallandsfar, Hallay, Hallberg, Halle, Hallegg, Hallenaut, Haller, Hallermund, Hallersdorf, Hallerstein, Halletius, Halleux, Hallez, Hallmann and many more. First found in Baden, where the family was anciently associated with the tribal conflicts of the area. Some of the first settlers of this name or some of its variants were: Egram Hall, who arrived in Philadelphia in 1730; Christian Henr. Hall, one of the Hessian troops in the American War for Independence who settled in Halifax, Nova Scotia in 1781. Motto Translated: Live that you may live forever. 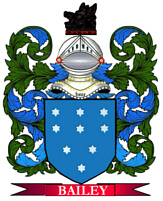 Meaning: The surname of local origin, and denotes simply 'of Hale/Halle' or 'dweller at Hale/Halle'. First found in Lincolnshire, England, where the family was granted lands after the Norman Conquest in 1066. Some of the first settlers of this name or some of its variants were: Christopher Hall who settled in Virginia in 1623; Alexander Hall settled in Virginia in 1654; Ann Hall settled in the Barbados in 1660; Daniel Hall settled in Delaware in 1682. 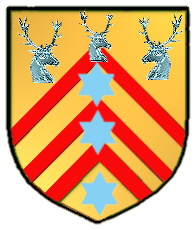 Coat of Arms: gold with three silver stag heads, three blue stars, and three red chevrons. 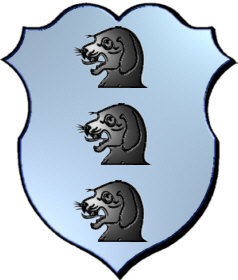 Coat of Arms: Unfortunately no coat of arms was found attributed to a bearer of this surname. 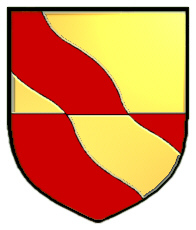 Coat of Arms: A shield divided per pale red and gold with a bend embattled counterchanged. Septs: Halle, Haule, Haul, Hal, De Aula, Hale, Haw, Collingwood, Crispin, Fitz William, MacHall. The history of Scotland, shrouded by the mists of time, indicates that the name "Hall", is a Norman surname. In Latin documents, the surname "Hall",is usually rendered, "De Aula".Professional historians used such ancient manuscripts as the Domesday Book (compiled in 1086 by William the Conqueror), the Ragman Rolls, the Wace Poem, the Honour Roll of the Battel Abbey, the curia Regis, Pipe Rolls, the Falaise Roll, tax records, baptismals, family genealogies, and local parish and church records to establish that the first record of the name "Hall", was found in Lincolnshire [England] where they were granted lands aftert he Norman Conquest in 1066. Stout. Later, under their Jarl, Thorfinn Rollo they invaded France about 940 AD. The French king, Charles the Simple, after Duke Rollo laid siege to Paris, finally conceded defeat and granted northern France to Rollo. Duke William who invaded England in 1066, was descended from the first Duke Rollo of Normandy. After distributing the estates of the vanquished Saxons, many nobles were dissatisfied with their lot. They rebelled. Duke William then took an army north, and wasted the northern counties. Many Norman nobles fled north and were granted lands over the border in 1070 by King Malcolm Canmore of Scotland. The border ballad "The Death of Parcy Reed" describes an incident that involved the "fause hearted Ha's of Girsonfield".